If I were to have a second middle name, it would be Ambition (my current middle name is Persistence). Sometimes ambition is good but sometimes ambition leaks optimism where realism is needed (especially in bleak circumstance). Mostly, such times usually speak of me trying to get from point A to point B quicker then the law would allow (fortunately, enough speeding tickets as a teenager have whittled my ambition to functioning within the limits of Uncle Sam). 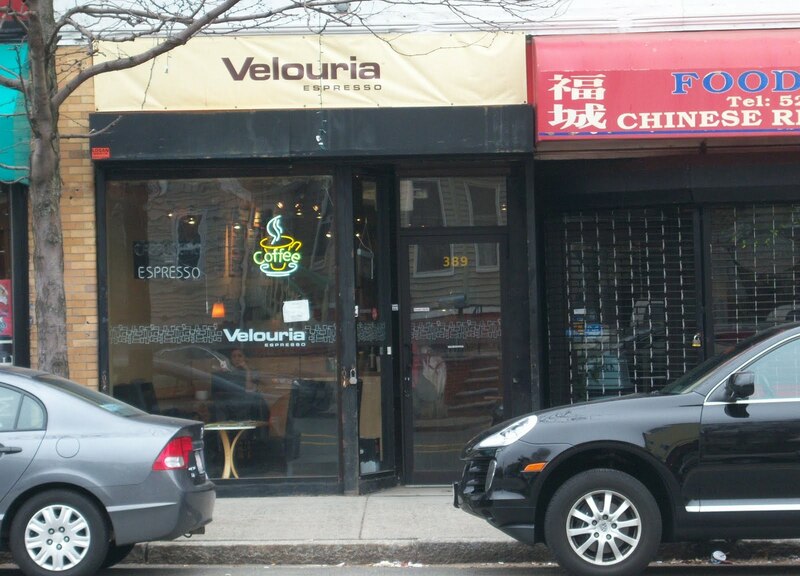 It was this last second ambition that twice drove me to Velouria Espresso, a cute cafe in the Jamaica Hill area of Boston, right as they closed (I hate that feeling of just missing something). So the third time I had the chance, I gave myself a little more time and lo and behold, my ambition and persisitence paid off. The cafe externally does not hold much except big windows and a nice awning, but inside, the small space is utilized well to hold several pieces of seating and a welcoming tan and black ambiance. In my research of Velouria, I had noted the existence of a Clover but sadly, it was down the day I arrived; so I went with a cup of George Howell's Vasenda Colombian (their house coffee) and an espresso. The Colombian, filtered, had flavors of minestrone, a nice earthiness, some sunflower, cherry and an overall smoothness. The coffee sampled well but it failed to blow me away (hard to say if it was the coffee or the brewer that lacked). The espresso, George Howell's Daterra Espresso blend according to the barista, was pulled medium/short and topped with blond crema. The flavors included a bit of cardboard, dark bitter chocolate, some lime, hints of cinnamon and a dark aftertaste. I would guess some of the negative aspects were due to barista style and in the end, it was a fair espresso. The tea is free leaf. As I wrapped up my visit, I was already (ambitiously) thinking of making another trip as I don't feel I showed up on a good day. Velouria had a lot of the makings for a great experience but little things seemed to get in the way. Alas, such is the nature of first impressions. If you happen to be in the area, I'd be curious your thoughts on Velouria Espresso. I used to live in Jamaica Plain and I love coffee. SO I checked out Velouria one day and was not impressed. First of all it was dirty, the coffee was ok but not worth a return visit. Next time your in the Boston area try Taste Coffeehouse in Newtonville. Great coffee! i was there 2 weeks ago and i love it there!